Recently, a new book arrived in our midst, emerging from the depths into our awareness and carrying with it ideas painted in language that births images that create a sort of magical effect on the reader. Indeed, the manuscript is “imagi-cal”—a dialogue between two astounding writers who are also profoundly cognizant of and driven by the power of dreams and the images they contain. In this conversation with the writers, Russell Lockhart and Paco Mitchell open up to Bonnie Bright about Dreams, Bones & the Future. BB: Great title! Where did it come from? PM: First of all, Bonnie, I would like to thank you for giving Russ and me the opportunity to talk about this unusual project, which has occupied much of our attention for several years. I say “unusual,” because everything about the project, including the title, was unplanned. We were less like two scholars researching a question than we were like two old dogs following a scent. In that spirit, then, of following the invisible, both the title and the entire book only became gradually visible to us—like the red spot emerging from the black background on the cover. Several years ago, various elements in Russ’ writings had begun churning among similar elements in my own writing until, like volatile chemicals, the whole mixture began sputtering and emitting sparks. This resulted in a longish email that I sent Russ, in response to an article he had written and a dream he had related. The resulting email exchange was so stimulating—insistent, even—that we just kept following it wherever it led us. The result was 144 pages, and this book. Without any deliberate prompting from us, certain concerns kept recurring—questions of the distant past and the emerging future. Dreams naturally do this all the time. But we also found that, in both symbolic and instrumental ways, “bones” also provided a link between past and future. Of course, in the opening pages of the book we treat this in greater detail. BB: How did you come to collaborate together on such a big project as a book, and this book in particular? RL: Hi Bonnie. I want to echo Paco’s appreciation for your invitation to talk about Dreams, Bones & the Future. How it became a book began in a dream I had, back in the winter of 2007. I dreamed I was working on a gourd that I was to make into a “dream-gourd” for casting the I Ching, to use in working with dreams. I made the dream-gourd and have regularly used it since that time. I wrote up this experience for my column, “Dreams in the News,” in the journal, Dream Network. Shortly after this was published, I received an extraordinary email from Paco. We were old friends, but had not been in touch for a long while. The letter was so rich, so full of sparks, so full of deep consideration of the synchrony of his reading my article at the same time as he was reading books by Brian Swimme and Thomas Berry, that I was compelled to respond in kind. His email was something like an oasis providing thirst-quenching waters for a thirst I did not know I had. Back and forth the emails flew and at some point, I suggested that others might be interested in what we were talking about, and I proposed that we publish in Dream Network. Paco agreed, as did the editor, Roberta Ossana, and so it went, on and on for several years. By the tenth published dialogue, we reached a point of pause, a repose of sorts. It was in this state that the idea of a book took shape and now it has materialized. As readers will discover, we are still in repose, but are about to set our craft sailing once again. In many ways, we have only just begun. BB: I first discovered your work when I read your book, Words as Eggs, Russ, right after you published a new edition in 2012. Paco and I met when he became involved in Depth Insights scholarly eZine and ended up becoming my co-editor for a period of time, as well as publishing several essays along the way. The commonality you mention above really comes down to both your fascination for dreams, and I think this is a topic that many individuals are hungry to explore today. We know that many ancient and indigenous cultures have relied on the wisdom of dreams to provide insight and direction for the entire tribe. What do you think the role of dreams is today for both individuals and the culture? Is it a constant or might it change in the future, especially in the context of the cultural and ecological crisis we are facing today? PM: Interesting that you use the term “hunger” in reference to dreams, Bonnie. It suggests there is something vital about dreams, something nourishing at a fundamental level. I heartily agree—there is a hunger, and it is far more widespread than most people realize. In fact, people are starving for something that the current exploitative and narcissistic culture cannot provide. It would be a good thing, then, if more people became aware of their own innate dream-hunger, of the deeper needs of their souls, even to realize that they are endowed with souls in the first place! To anyone who bothers to pay attention, over time, dreams offer an unfailing immersion in the images, demands and needs of the soul. Along with this comes the enduring sustenance of a life-long sense of meaning. Such a life-long sense of meaning, though given, does not come to us without effort. But given it is, rather like a first language that we were born knowing as babies, but have forgotten how to speak as we “grew up” over time. Clearly, something vital is lacking in our present situation. The values we mirror to one another as worth striving for—mostly celebrity, wealth and power—all fail the crucial test: They do not guarantee this meaningful sense of life I’m referring to. For centuries, Christianity and other religious world-views held out against the secular values, but scientific rationalism, the technologies it spawned and the personality that they created, left the deeper values behind, and even came to undermine what often passes for piety today. But this world of lost values is precisely what dreams, given half a chance, cannot fail to illumine and regenerate. It’s that “half-a-chance,” Bonnie, that your own many initiatives, such as Depth Insights and your other venues, or Russ’ and my just-released book, Dreams, Bones & the Future, or our Owl & Heron Press, and so forth, are offering to those who are dream-starved. Knowing what I do about dreams, it still amazes me that most people, when offered an opportunity to talk about their own dreams or those of others, either stand flat-footed, not knowing what to say, or they turn and run in the opposite direction. But I believe there is a “streak” in each personality that naturally inclines in the direction of dreams, whether it is consciously recognized or not. Call it a root, if you will, or perhaps an artery or vein, a muscle or spine—something organic, structural and dynamic. The fact is that dreams are built-in, vital necessities, like a pulsating heart, or breathing. Or we could think of dreams, it now occurs to me, as being as necessary to us as feathers and wings are to birds. BB: Paco, when you talk about our innate “dream-hunger” and how dreams are “as necessary to us as feathers and wings are to birds,” something resonates with me at a very deep level; it’s almost as if you are tapping into a channel that goes straight to my core. Taking a cue from you both and your obvious love for language and image, I looked up the root of “resonate” and discovered it means “to sound again.” I found this fascinating because it does appear that when I hear something that “resonates” then, it is as if it is simply tapping into something within me that already exists! Your allusion to dreams being the first language, even as babies, and the etymological connection Russ makes regarding the “infant” and “speaking” is synchronistic to me personally. I have always looked to my dreams to help me understand my work in the world, and I have had a series of dreams where babies suddenly start to speak or sing. In these dreams, the common thread is that I am always caught by surprise at that hidden or latent capability, that wisdom inherent in the tiny baby. Of course, Jung talked about an ancient wisdom inherent to all of us, a “two-million year old [hu]man” that serves as fountainhead of age-old archaic wisdom carried over since the earliest manifestations of life as an evolutionary heritage. The dream wisdom is not only accessible to all of us—it is our heritage. It is as if we live within the dream wisdom itself, just like those nested dolls. In the book, you both point to the evolutionary history of our ancestors, and the age-old practice of “throwing the bones” to garner understanding. Russ, you even recount a profound dream you had that led you to a new oracular practice that developed out of the dream, that of using a “dream-gourd.” As we begin to wrap up this all-to-brief exchange, can you both share some of your own associations we can find in the book that encompass these ideas of ancient wisdom, human history, and divination through dreams? PM: Bonnie, I want to respond to your question with three parts. I want us to think about dreams as being squarely located within the biological, evolutionary context out of which we ourselves emerged so long ago—at least the mammalian wing, if not the avian wing! I can’t prove this, but it makes eminent sense to me that we were dreaming long before we were humans, when hair still covered our bodies and we were creeping and crawling along just like the rest of our even-more-ancient animal precursors and cousins. Our present-day cousin, the modern bear, for example, sleeps—and presumably dreams—for months at a time, but may have begun evolving toward its current form around thirty million years ago. That’s a lot of mammalian sleeping. So, if my assumptions are anywhere near correct, we humans were dreaming long before we were humans, long before we developed the enlarged brain that required a bigger skull, a more difficult birth, a slower rate of development in infancy, more protection through childhood, and the like. Before tribal hunting societies (many of whom worshiped the bear), before agriculture, before civilization. Thus, dreams may have existed for longer, and may be far more deeply embedded in our physical and psychic make-up, than we can begin to fathom. This begins to touch on the “necessity” of dreams, which—I might as well say it—could be regarded as cosmic phenomena. In view of this vast precedence of dreaming, then, I would ask—whence derives this modern foolishness that depreciates so profound, so natural, so inborn, a capacity? You yourself point out, Bonnie, that dreams come to us laden with all the wisdom of nature. Even more—nature’s wisdom speaks to us personally in dreams, sending us “messages” that are finely tuned to fit the deepest aspects of our personalities, in and of themselves, and how we fit into our collectivities! No shoe did more finely fit any foot! No wonder, then, in times past, there was a well-recognized tradition that Jung often pointed out”—dreams sent by God,” somnia a Deo missa. (2) You bring up the matter of “resonance,” citing the etymology of the word—re-sonare, “to sound again.” As a guitarist, this is not only a useful metaphor to me—saying that something “resonates”—but it is also a physical, emotional, soulful and spiritual fact. If my guitar is on its stand and I speak loudly, or clear my throat, the strings on the guitar resonate—in fact, the entire body of the instrument, strings and all—resonates in response. When flamenco guitar-makers in Spain build the sounding-boards (the tops) of their guitars, they will sand thin pieces of close-grained spruce to such fine tolerances that if they tap the bare wood it vibrates to a certain note, usually A. Considering all the glue-joints, the braces, the string-tensions, the sound-hole, the angles of the components in any fine instrument, the guitar-maker is building resonance into it. And as with instruments—which have both bodies and souls—so with humans. This reminds me of a dream I had in the early 1970s—before I began my formal study of dreams. That dream led me to regard “resonance” as an archetypal characteristic of the cosmos. On a physical level, of course, resonance may pertain to the gravitational fields of celestial bodies, the spacings of planets and dust-rings, super-galactic harmonies and modulations (if there are such things), and so forth. But I think “resonance” also pertains to psychological, moral and spiritual qualities: As above, so below. In the dream, I was walking through the central hallway of an art school, searching for the artistic activity that suited me best. My “search” consisted in my plucking a single string—a “monochord”—that ran from my clavicle to my pelvis and emitted a single note, with overtones and undertones. 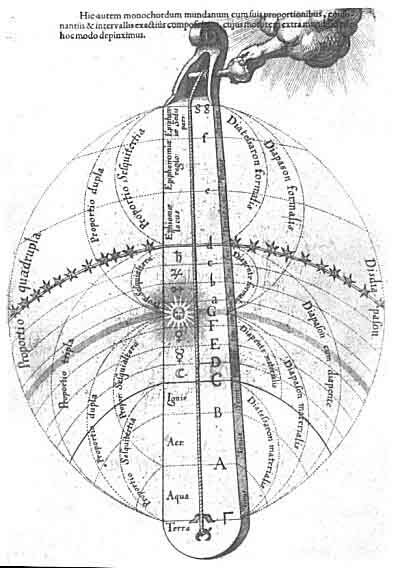 Years later I opened up a Jung volume and came across Robert Fludd’s medieval drawing of the Celestial Monochord. 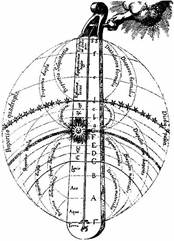 The drawing fairly burst into my consciousness as a medieval precursor to my dream, depicting the divine action of God’s hand tuning the “monochord.” The vibrations of the primal string, along with all of the overtones and undertones—the resonances, we could say—brought the known universe into being, in all its aspects. In similar fashion, the vibration of the central string in my dream implicitly brought my entire personality into being. What I was looking for was the central or “fundamental tone,” another word for destiny, a bio-psycho-spiritual-cosmic purpose. So, when you say that something “resonates inwardly,” Bonnie, I too want to pay attention, for these and many other reasons. (3) The final aspect of your question touches on the origins of our book, which, as Russ explains in his Introduction, began with a train of events that, over time, led to his having a portentous dream. The dream was nothing less than a new form of access to oracular awareness, virtually invented in the dream—a new way of casting the old I Ching. This gives a clue as to the deeply creative functions that can be found in dreams. Russ called the device the dream-gourd and subsequently brought it into material existence. I know this touches on ground we covered earlier, but you asked for an example from the book! Also, it’s hard to over-emphasize the excitement I felt when I first read—then re-read—Russ’ article about the dream-gourd and I felt the intuitions start clanging away in me, resonating with the volume I was reading at the time—The Universe Story, by Brian Swimme and Thomas Berry. One particular phrase got the ball rolling, where they described the archaic, mantic tradition of “throwing the bones,” and the universally recognized fact that, when the bones left the human hand, they became subject to the governing forces of the universe. That is when the bones took on their uncanny oracular power—when they were no longer subject to human control. In a nutshell, that is what Russ and I have been pursuing throughout the book—following the subtle traces that begin to reveal themselves when humans give up their fantasies of control. Paco has laid out a broad foundation for tending not only the evolution of dreams, but by implication, the importance of dreams as a causal factor in evolution itself. This factor is one reason why I describe dreams as always having to do with the future, and also why I emphasize the fictive purpose of dreams. Fiction is alive with possibilities, while trying to pin down dreams to singular facts of understanding, interpretation or explanation is essentially pinning the butterfly’s wings to the pin board. I’m not a fan of netting the butterfly in this way. As hard as it is, I want the butterfly to “lead” the way. Of course, I am here speaking of butterfly as psyche, dream as butterfly. I’m imagining building an outpost on the far edge of Paco’s foundation and gazing out into the future. As our cultural dominants begin to collapse, and chaos begins to render our traditions into shards, each screaming for survival, I hear Jung’s insight that the new dominants are being born in the objective psyche, and that these new dominants will come into being through the dreams and visions of individuals. To the extent that individuals are immersed to point of drowning in collectivity, they will not hear the call of the future that begins to speak to them in their dreams, in their visions, in experiences of synchronicity. Very often it is the broken individuals who will hear first. This is why I pay attention to the dreams of people on the street. Very often it will be through the artist, usually the outcast or unrecognized artist, not the one who is taken up with the contemporary seductions of money, that the future begins its intimations in consciousness. Such intimations must be hosted and there is no room for such hosting when everyone is taken up with what Walter Wink calls the “malignant narcissism” of the day. Psyche’s evolution is at work in the collective unconscious, as Jung experienced and described; and what Paco and I have tried to do in Dreams, Bones & the Future, is to illustrate various ways in which individuals may begin to participate in this effort before it is too late. We hope to take up these issues even more deeply in the next volume of our dialogues. So, you can see Bonnie, we share at least some degree of optimism! The Greek word for “messenger” is angelos, from which we derive “angel” in English. For a fascinating discussion of the premise that every dream, potentially, is an “angel,” see Russell Lockhart, “Dreams As Angels: Parts I — IV, Dream Network Journal, Vol. 31, Nos. 1-4 (Spring 2012-Winter 2013). Pictures of the dream-gourd and its manner of being used in casting the I Ching can be seen at the “Dreamgourd” blog at http://dreamgourd.blogspot.com. Russell Lockhart, a Jungian analyst for 40 years, is author of Words As Eggs, Psyche Speaks, and many articles in depth psychology. Currently focusing on the fictive purpose of dreams, commodification of desire, and a novel, Dreams: The Final Heresy and projects as co-editor of Owl & Heron Press. Paco Mitchell is a Jungian author, artist, therapist and editor, dedicated to the study of dreams. His main interest is in the psychic developments taking shape in the collective unconscious and striving toward consciousness in dreams. Co-editor of the Owl & Heron Press, Paco lives in Santa Fe, New Mexico.